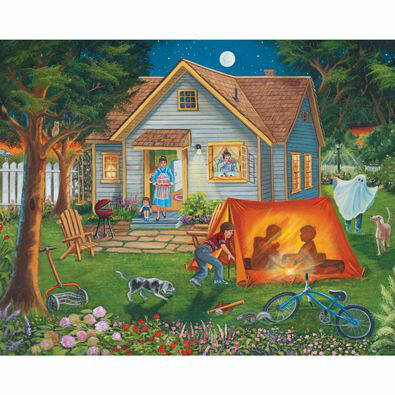 Backyard Camping is a 500 piece jigsaw puzzle designed by artist Christine Carey. The neighborhood boys are camping in the backyard tonight. A tent is set up and they are telling stories by flashlight. Bikes are parked on the lawn and the dogs are sniffing around while mom brings snacks into the yard for them to enjoy. Available in three piece counts. • This jigsaw puzzle measures 16" x 20"
This 500-piece jigsaw puzzle is designed by Keith Kimberlin and measures 18" x 24 This puzzle features a collage of different kittens. Available in two piece counts. This 500-piece jigsaw is designed by Joseph Burgess and measures 18" x 24". This puzzle offers a peak into the past at a traditional ice cream parlor. Available in two piece counts. This 500 piece jigsaw is designed by Mary Thompson and measures 18" x 24". Available in two sizes. This 500-piece jigsaw puzzle is designed by Larry Jones and measures 18" x 24". Duck and geese swim together in a lake in front of a forest cabin. Available in two piece counts.